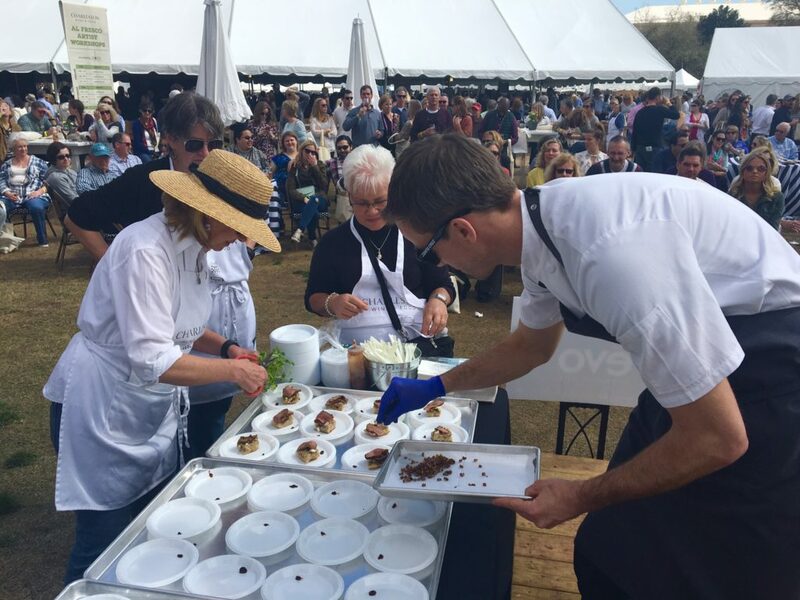 Charleston Wine+Food brings to together amazing chefs. 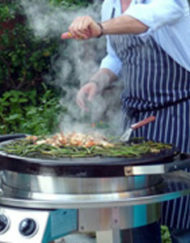 Several that did a demo on our Evo Grills in the Rose Garden were willing to share their recipes with us. 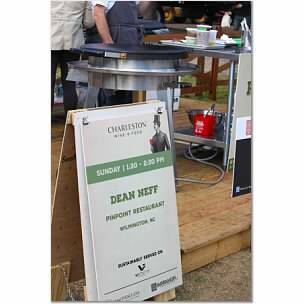 Here, Chef Dean Neff shares his Harissa recipe from Charleston Wine and Food. It’s destined to become one of your new favorite condiments this grilling season! But the uses of this flavor packed condiment are only limited by your imagination. So Enjoy! 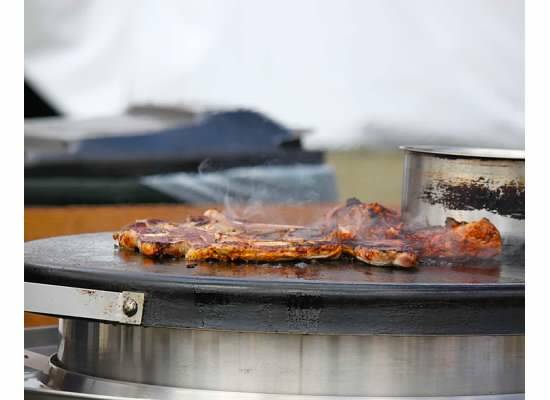 Here the Harissa marinated lamb gets a quick grill on the Evo Grill. It will be sliced and served as bruschetta. What is Harissa? Some of you may not be familiar with this versatile, spicy condiment. Basically, Harissa is an aromatic chili paste that’s a widely used staple in both North African and Middle Eastern cooking. Like curries or chutneys, Harissa recipes will vary between countries and regions. A basic version usually contains a blend of peppers (which are often smoked), garlic, olive oil and spices, like cumin, coriander, caraway and mint. Tomatoes and rose petals are also common ingredients. Harissa Paste might be your new favorite condiment. 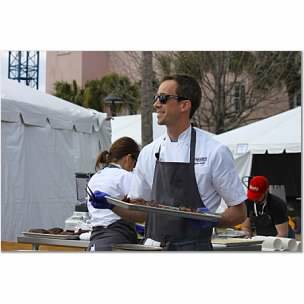 Our recipe is from the talented Chef Dean Neff of Pinpoint restaurant which is located in the beautiful historic coastal town of Wilmington, NC. 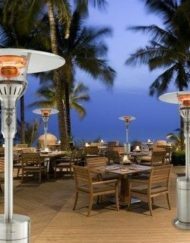 (If you haven’t been yet, it would be the perfect spot for your next getaway). He uses easy to find ingredients that are exciting without being too scalding or exotic for most American palettes. And it keeps for a month in your refrigerator. So you’re sure to find lots of varied uses for your new favorite condiment. Don’t you just love an easy new way to spice up basic grilled meats, seafood, and vegetables? Mix all ingredients into a mortar. Gently pulverize all ingredients together with a pestle until they come together and form a paste. You can also pulse in a food processor gently if you do not have a mortar and pestle. Store refrigerated for up to a month. Use as a marinade/rub for beef, pork, chicken, tofu, vegetables or meaty fish like Yellowfin Tuna. At the restaurant now we are using Harissa to garnish our creamy peanut soup. 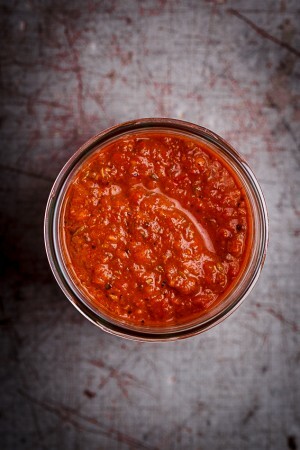 Harissa is an amazing condiment to have on hand to dress up sandwiches, rice, beans, fruit like watermelon or mango, etc. You can experiment with different blends of chili powders based on your tolerance for heat. The first layers of flavor go on before heating on the evo grill. Bruschetta went onto the evo grill for a quick warming. Then it was toppedwith lamb, salsa verde, and watercress. 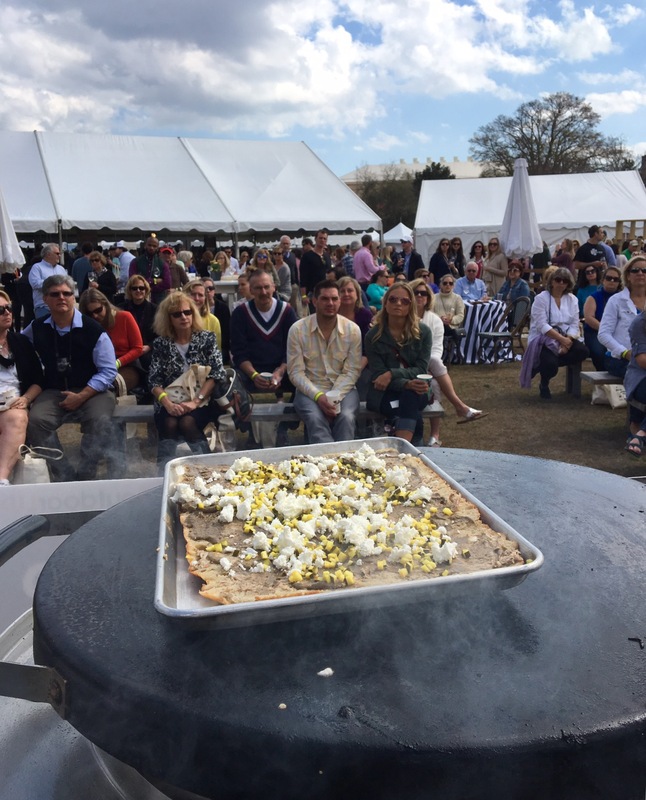 Chef Neff made a beautiful multi layered bruschetta using this Harissa recipe last weekend for the Charleston Wine and Food Festival . 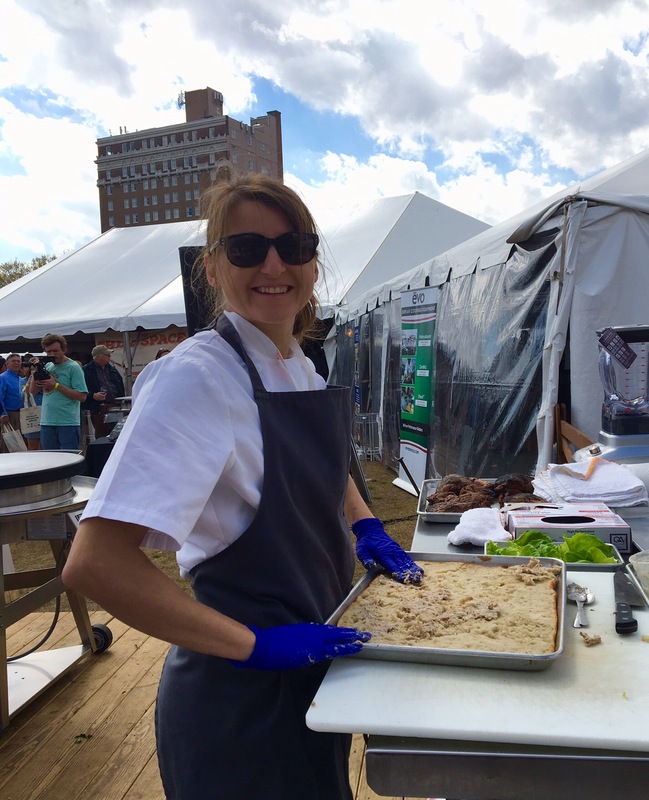 His Pastry Chef Lydia Clopton had made a focaccia to use as the base. Charred eggplant, deviled lamb, pickled summer squash, NC goat cheese, and benne oil was warmed. Then the evo grilled harissa marinated lamb,salsa verde and watercress were placed on top. Huge flavor. 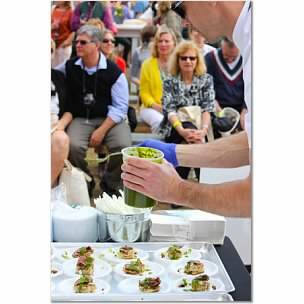 Chef even thoughtfully offered tender bibb lettuce as a substitute for the gluten intolerant in the crowd. But I think the lettuce wraps would be a great option on a hot summer’s day for all of us. For an easy vegetarian option, I recommend simply skipping the lamb ingredients and using the other beautiful layers with the harissa to finish. 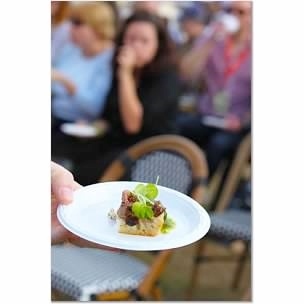 Guests of Charleston Wine and Food loved Chef Nuff’s Harissa marinated lamb dish. Big happy grins were visible on all the faces who got to try it. Chef even served a dollop of the harissa on the side of the plate to allow guests to kick up the bruschetta if they were so inclined. 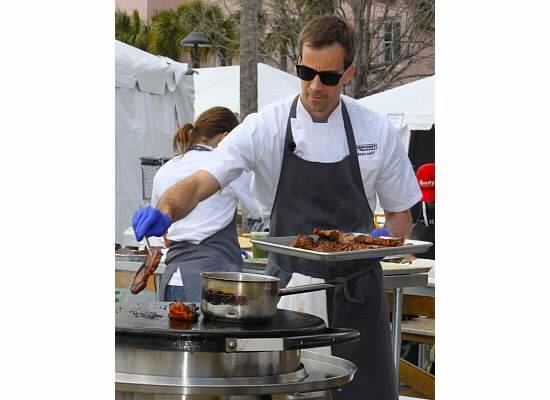 Chef Dean Neff sears the lamb on the evo grill. Most everyone did, and declared it flavorful but not too hot. I personally asked for a double dollop right on top! Loved it. Thanks to Chef Dean and Chef Lydia for sharing their time and passion with us all. Let me know how you use the Harissa if you make it. I loved Chef’s recommendation of a watermelon and goat cheese salad with a dollop of harissa on top. Here are 13 more ways to use Harissa from Bon Appetit to get you started. I’ll be posting ways I use it on my Instagram feed (@outdoorlux) once I make it. But I wanted to get the recipe out to you all as soon as possible. 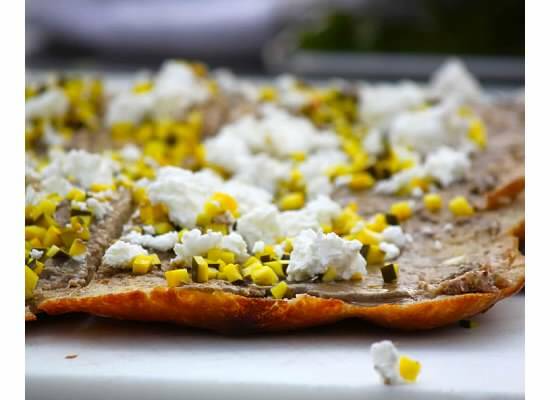 Because lots of our audience members were asking for the recipe after trying this dish. 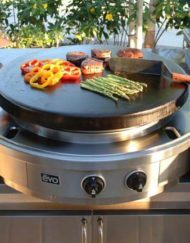 And don’t forget that our CHSWFF special pricing on evo grills will run through the week! Use the code we shared at the festival to receive the deal (or contact me for details). 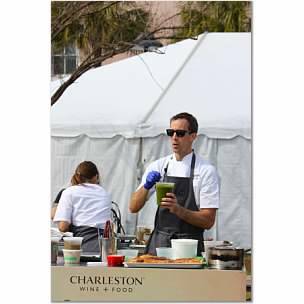 Charleston Wine and Food offers great demos to inspire the home chef. 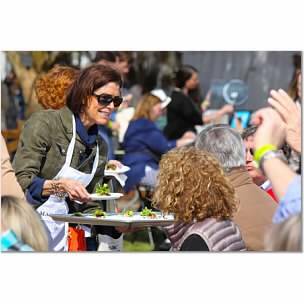 I’ll have more another amazing recipe from Charleston Wine and Food coming up in my next post! Stay tuned.